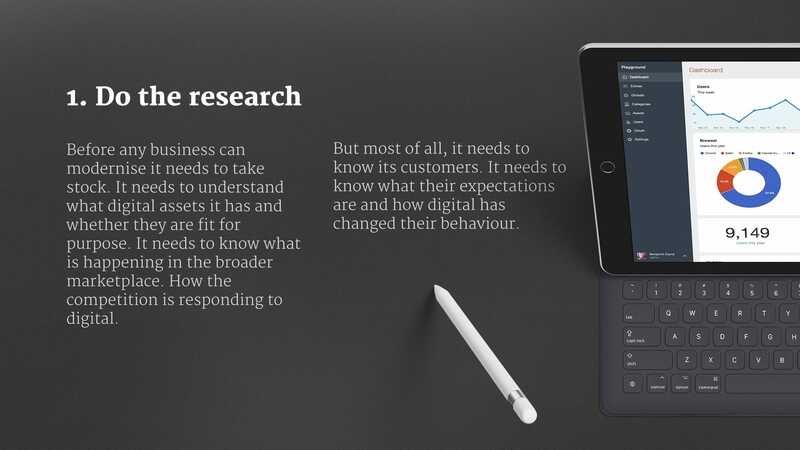 Digital transformation and user experience design are about modernising businesses. Modernising them to better perform in today’s market. But what does that mean in practice? What goes into modernising a business? The world has changed. Digital has changed it. Customers have different expectations from 10 years ago. Our businesses need to adapt if they are to survive. They need to modernise to meet the needs of today’s connected customers. To leverage digital technologies to their advantage. But how? There is no one size fits all when it comes to making a business competitive in the 21st century. It depends on the state of the business, the sector and the customer. But most businesses travel a similar path. A path consisting of 12 steps. Before any business can modernise it needs to take stock. It needs to understand what digital assets it has and whether they are fit for purpose. It needs to know what is happening in the broader marketplace. How the competition is responding to digital. But most of all, it needs to know its customers. 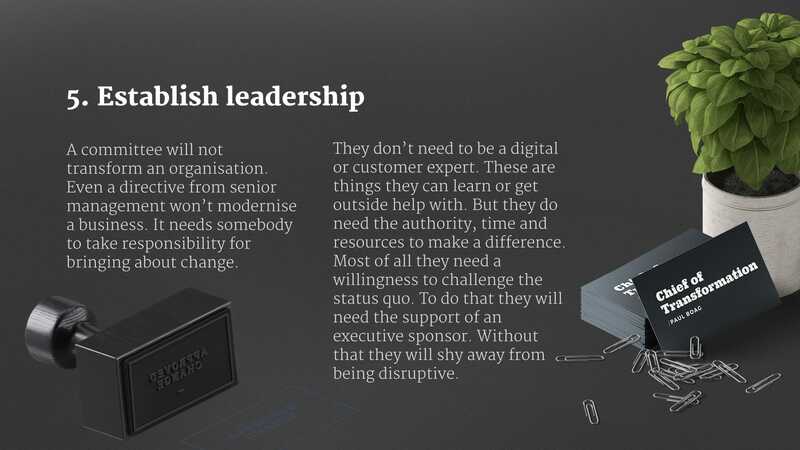 It needs to know what their expectations are and how digital has changed their behaviour. In most cases the customer journey has changed beyond recognition. Digital has transformed how people find and interact with your business. Understanding what this new experience looks like is crucial to business success. 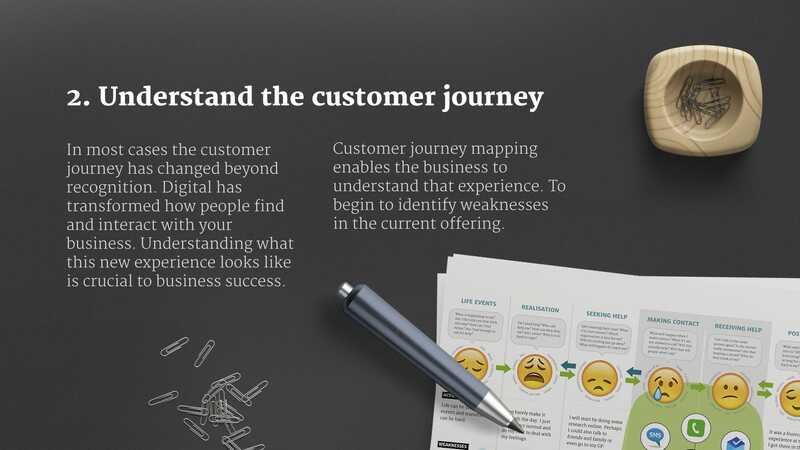 Customer journey mapping enables the business to understand that experience. To begin to identify weaknesses in the current offering. After understanding the customers experience and expectations it's time to analyse how to respond. There will be opportunities to improve the experience and gain a competitive advantage. But there will also be threats where the business is losing customers to poor service. 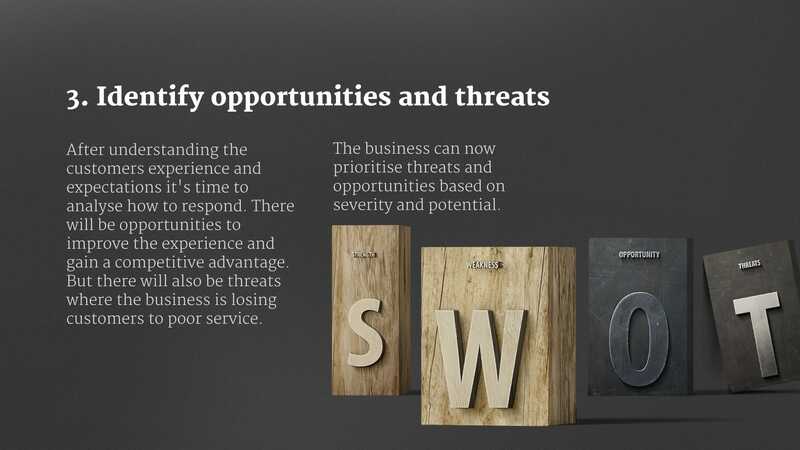 The business can now prioritise threats and opportunities based on severity and potential. To ensure the whole company is moving in the same direction it is necessary to have a single vision of the future. Something everybody is working towards and can understand. A mission statement is too vague and an in-depth strategy too inaccessible. 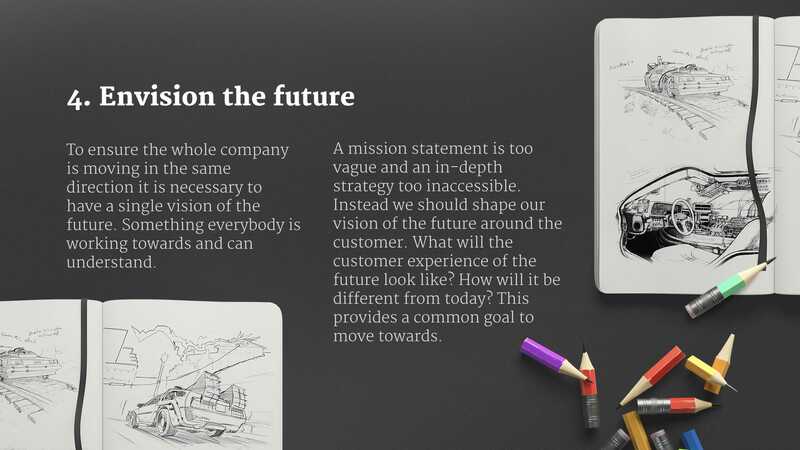 Instead we should shape our vision of the future around the customer. 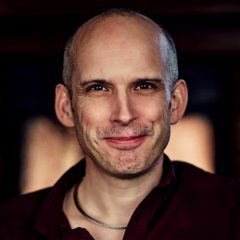 What will the customer experience of the future look like? How will it be different from today? This provides a common goal to move towards. A committee will not transform an organisation. Even a directive from senior management won’t modernise a business. It needs somebody to take responsibility for bringing about change. They don’t need to be a digital or customer expert. These are things they can learn or get outside help with. But they do need the authority, time and resources to make a difference. Most of all they need a willingness to challenge the status quo. To do that they will need the support of an executive sponsor. Without that they will shy away from being disruptive. No one person can bring change alone. Meeting the needs of connected customers in our complex digital world is a big challenge. A challenge that involves people across the organisation with different skill sets working together. 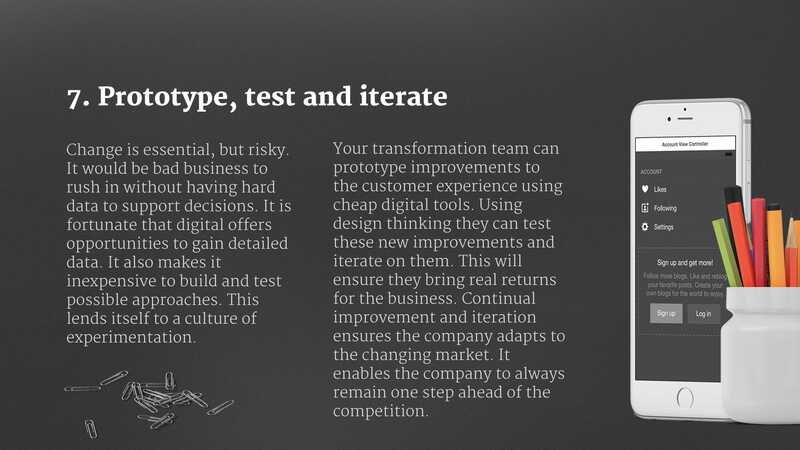 A transformation team will need to develop strategy, prototype approaches and bring about change. 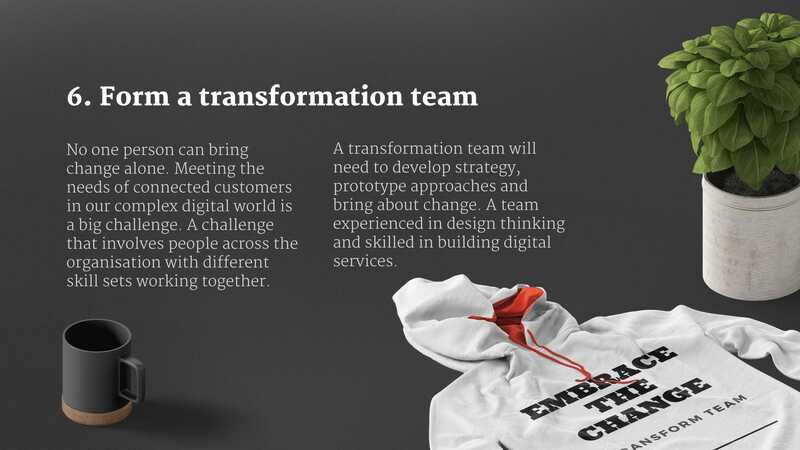 A team experienced in design thinking and skilled in building digital services. Change is essential, but risky. It would be bad business to rush in without having hard data to support decisions. It is fortunate that digital offers opportunities to gain detailed data. It also makes it inexpensive to build and test possible approaches. This lends itself to a culture of experimentation. Your transformation team can prototype improvements to the customer experience using cheap digital tools. Using design thinking they can test these new improvements and iterate on them. This will ensure they bring real returns for the business. Continual improvement and iteration ensures the company adapts to the changing market. It enables the company to always remain one step ahead of the competition. Your transformation team will be building a new culture. It will be changing the way the organisation interacts with customers. But this best practice must happen company wide. As out of date policies and procedures get replaced, new ones need to be brought in. A key step along the journey to transformation is to formalise the changes made. 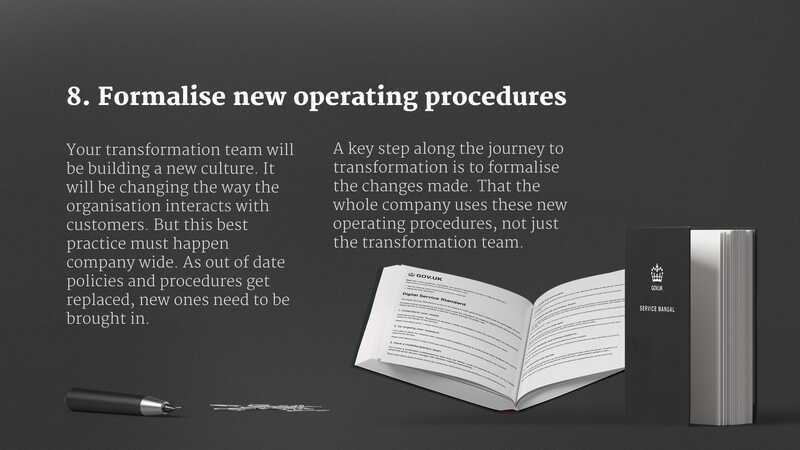 That the whole company uses these new operating procedures, not just the transformation team. The modernisation of a business needs every employee to be on-board. They need to understand the need for change and be capable of applying those changes to their daily work. This means undertaking a programme of education and communication. The business needs to train its staff in the use of digital tools and customer service. 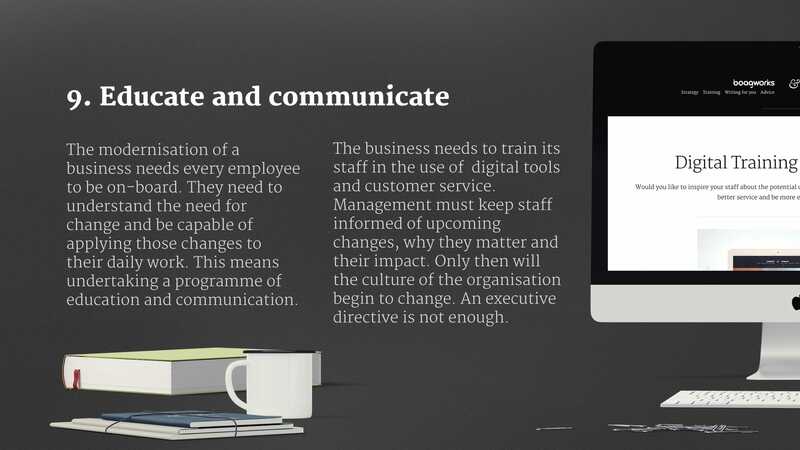 Management must keep staff informed of upcoming changes, why they matter and their impact. Only then will the culture of the organisation begin to change. An executive directive is not enough. As change takes hold, old departmental structures may become a barrier to success. Previously appropriate business silos could prove problematic in a customer centric company. In such cases these structures may need changing. 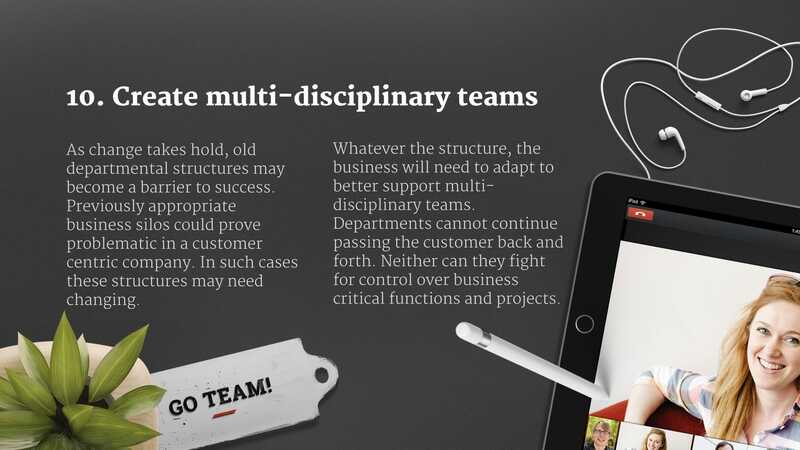 Whatever the structure, the business will need to adapt to better support multi-disciplinary teams. Departments cannot continue passing the customer back and forth. Neither can they fight for control over business critical functions and projects. A customer first approach will never take root if it goes against employees interests. If the business assesses staff or teams on a metric they will focus on that to the exclusion of all else. This can devalue the needs of customers. 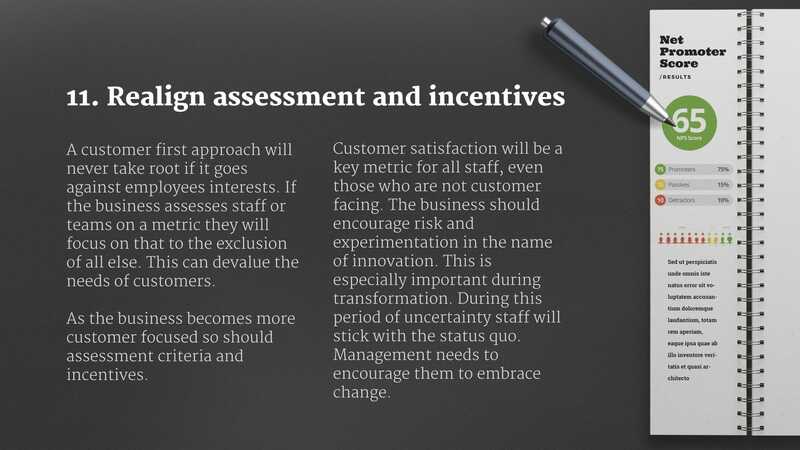 As the business becomes more customer focused so should assessment criteria and incentives. Customer satisfaction will be a key metric for all staff, even those who are not customer facing. The business should encourage risk and experimentation in the name of innovation. This is especially important during transformation. During this period of uncertainty staff will stick with the status quo. Management needs to encourage them to embrace change. Transformation will never be complete. It is an ongoing journey that adapts to changing market conditions and customer expectations. But in time your business should have a structure better suited to continual adaptation. People, policies and culture that can adapt to the dynamic nature of modern business. In time attitudes will have changed. Management will have prepared staff and realigned their own thinking. At this point the business will be ready to empower employees to make decisions on the ground. The power will lie with those who work with the customer daily to bring about change. 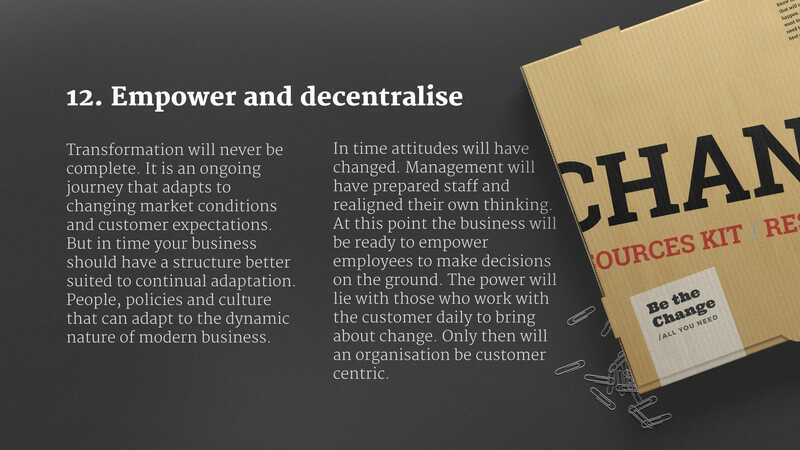 Only then will an organisation be customer centric. The 12 steps don’t always happen in order. Often several steps are happening at the same time. Your company maybe weak in some areas and strong in others. Whatever your situation there is one constant, you cannot stand still. The world has changed, business has changed and now you need to change too. If you need help making that happen, get in touch.